I’ve applied for the Costume College Scholarship. I don’t know what my odds are but I am swinging between hopeful and realistic. Why reinvent a crappier wheel! On Saturday I went to a craft sale. I had minimal interest in the sale itself…what I really wanted was to get inside the building it was being held in. The building was an old CP Rail building (1904) that had be converted into a space for the local aboriginal community to use. Not being of aboriginal decent, I had no earthly reason to go in it. My primary interest in it was that it was the forth station to stand on that site and it was at that site, my Great Grandfather would have arrived in Winnipeg before walking a couple of blocks to get to a hotel. He spent the night in the hotel and then walked across the street to the old city hall to find work. I did a blog post about that a few years ago. While at the craft sale, I took photos with the intention of sharing here. There was such a crush that it was doubtful these photos would have looked good. Well, low and behold, I found a Facebook page that did a much better job…so enjoy! 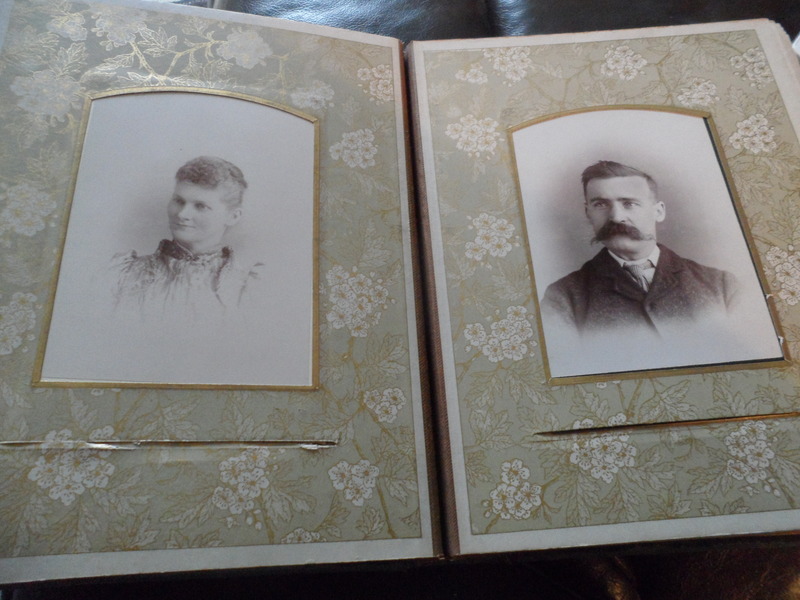 The next page of my photo album has head shots of a woman and a man. 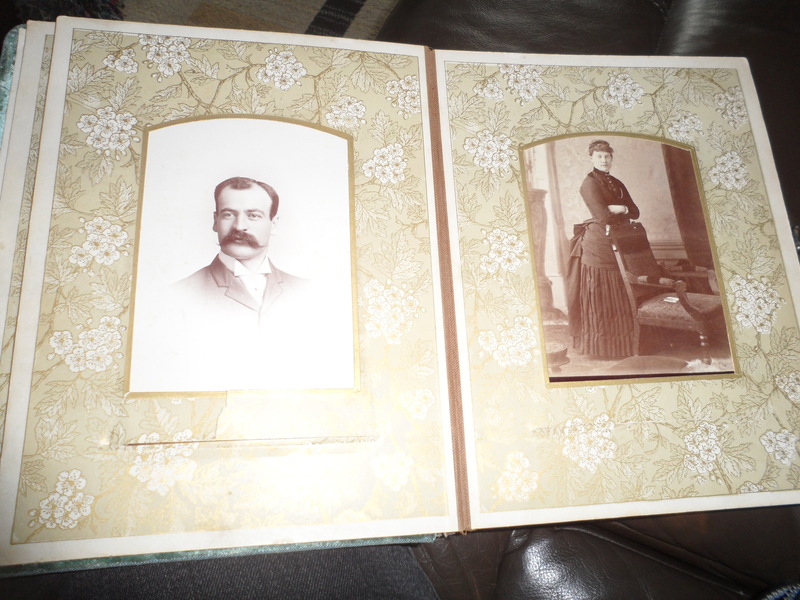 There is a similarity in style that might lead one to believe these are companion photographs of a husband and wife. As we will see in a moment, they likely are not as they were not taken in the same city. 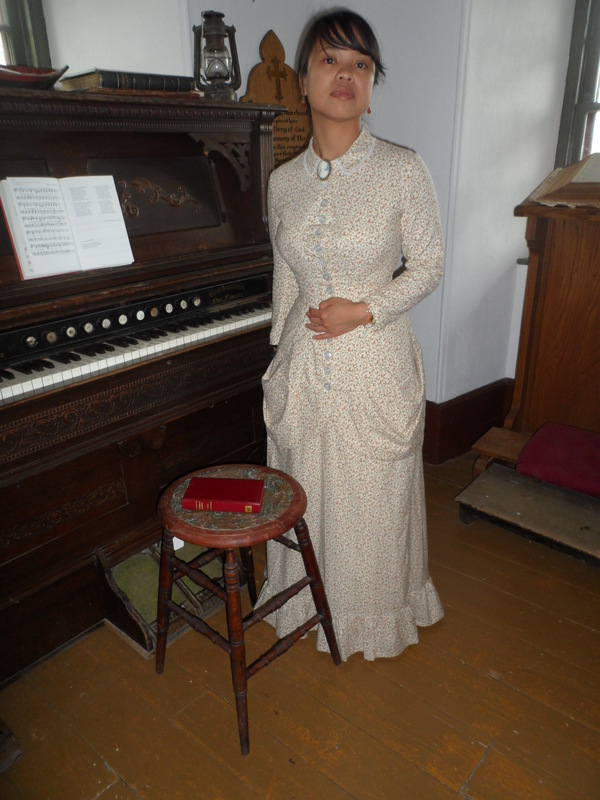 1880’s hair and possibly 90’s sleeves. 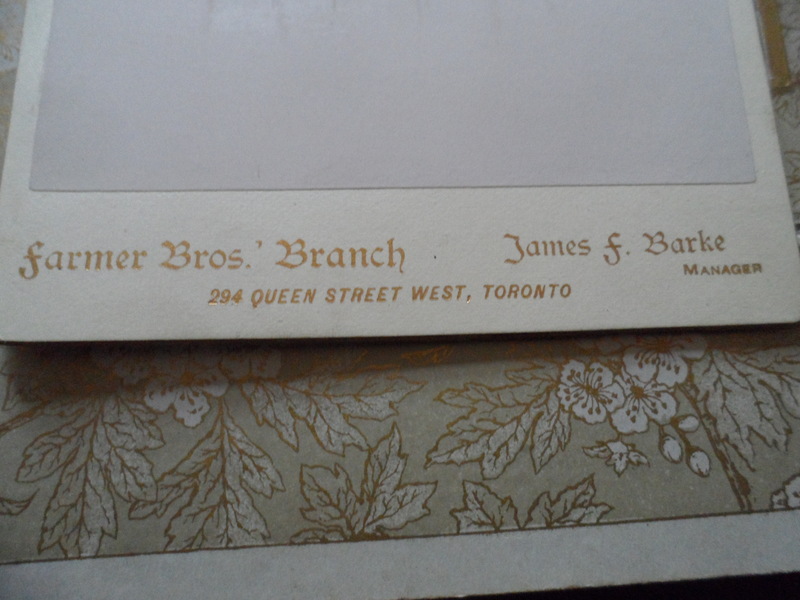 I was not successful locating any information on the Farmer Bros. other than a few examples of their work. 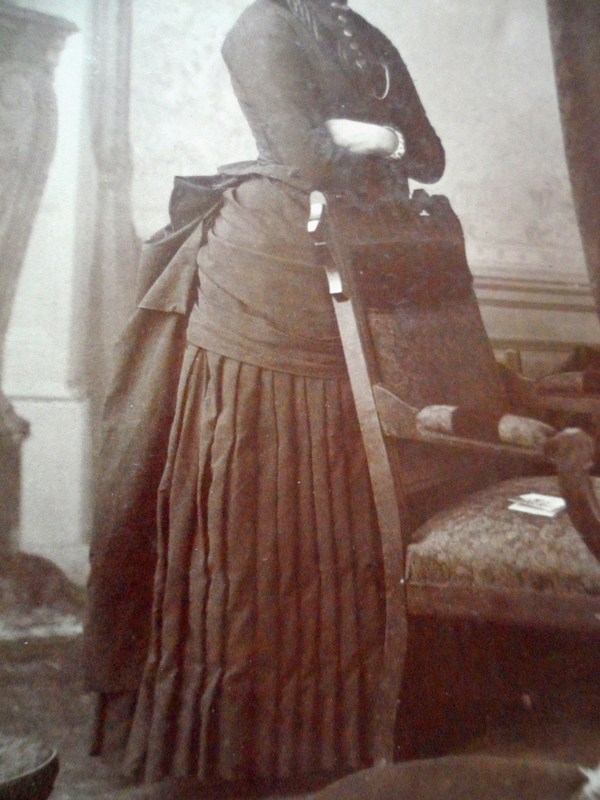 James F Barke was a photographer in the 1880’s and 90’s. I was unable to find any information about 294 Queen Street other than it had various business’ (some of them photography studios) but no firm dates. 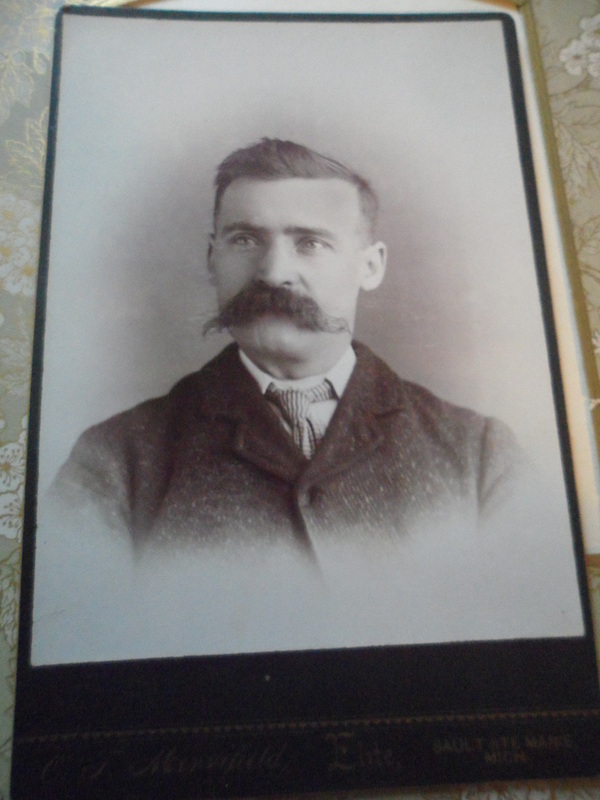 His latest fellow had his photograph taken in Sault St. Marie Michigan. Okay, lets look at the patterns. General looks of the subjects….The gentleman above has the same mustache, hair color, eye brows and nose as the fellow from an earlier post on this album. And the same nose as this fellow from the last post. Winnipeg – album was bought in Winnipeg. Photos taken in Sault St. Marie Michigan. Does location imply family groups? If the man, woman and children from Toronto, are a nuclear family why are they grouped in the book so randomly. Were they put in by the original owner randomly? In order of receiving them? Are they even in the original place the first owner of the book put them in? Have random family members and collectors pulled them out and rearranged them? Are they even related to each other or known to each other as friends? There are patterns but there are more questions than answers. 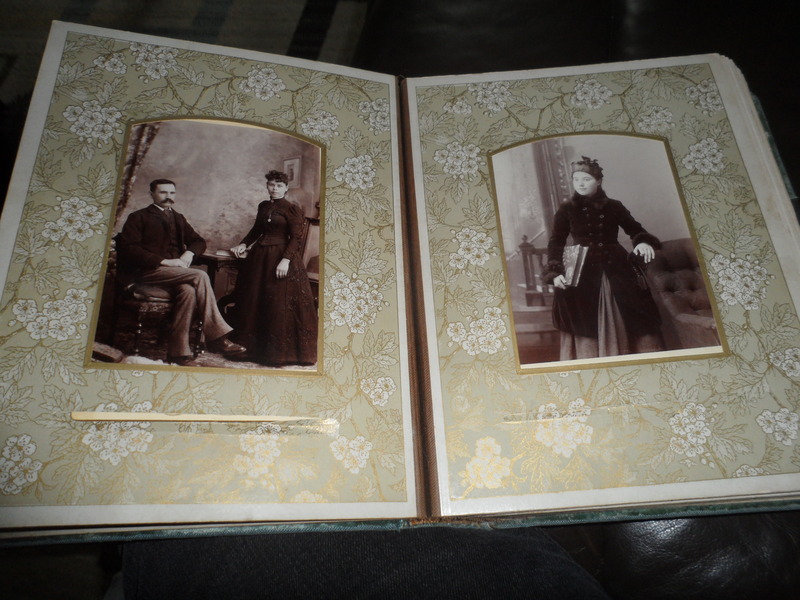 The last page of my new photo album that I wrote about was a man and a woman. 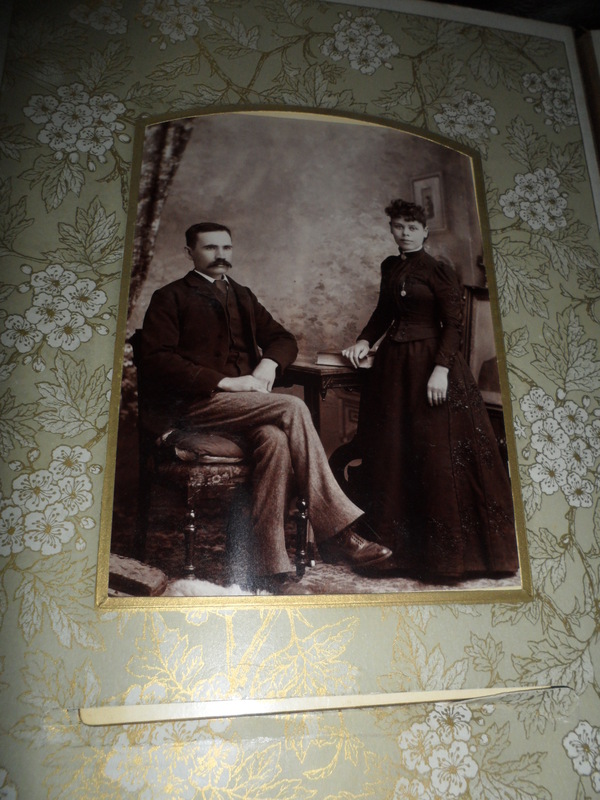 The man’s photo was taken in Toronto (as was the children’s photo on the previous page) and the woman’s photo was taken in Winnipeg. The next page features a couple on one side and a young lady on the other. Let’s focus on the couple first. Once out of the album, we see that the couple were from Winnipeg like the lady from the page before and also where the album was purchased. With a convoluted search that I wont trouble you with the links for, I discovered the photographer was J.F. 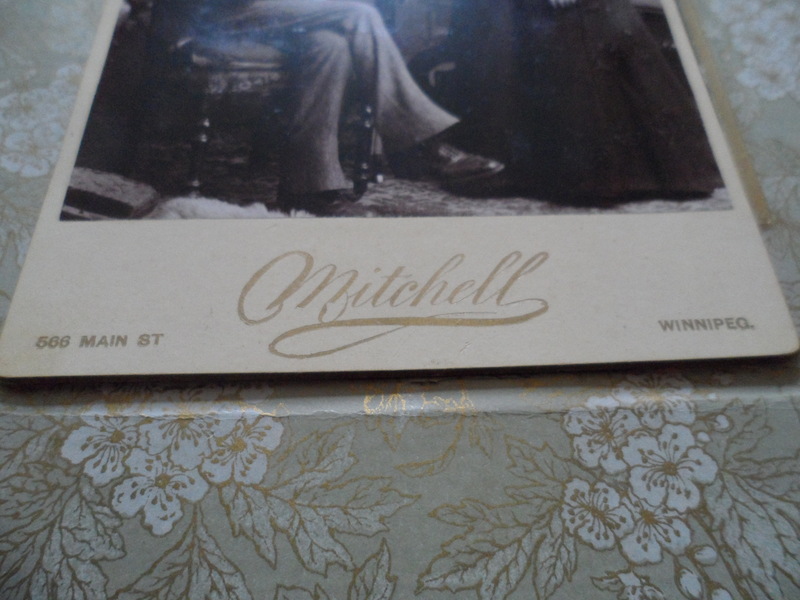 Mitchell and he was working in Winnipeg from 1889-1907. 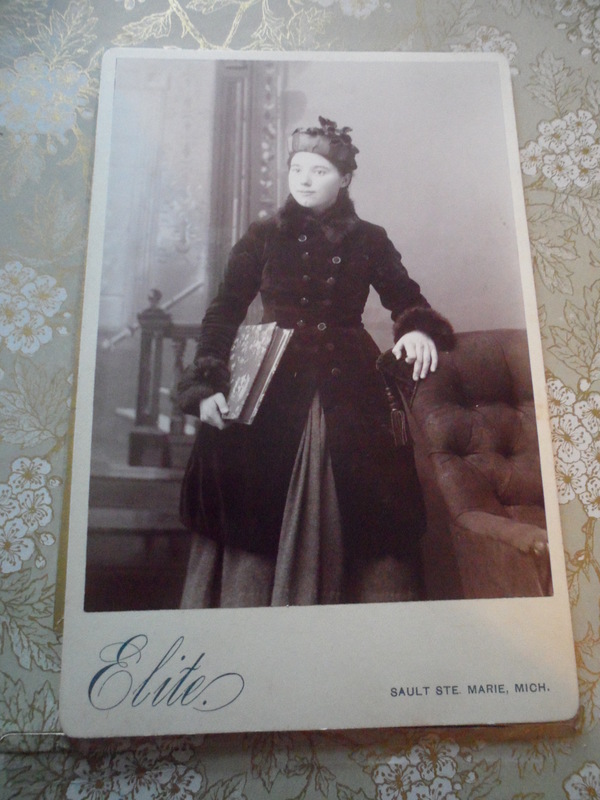 The lady’s hair style was popular in the 1880’s but the dress looks more belle epoch than bustle so I will estimate the photo to be 1889-1895. Next is the young lady. Snappy winter ensemble she has! Once we slide her out of her sleeve we see she did not have her photo done in Winnipeg. In fact, it wasn’t even done in Canada. There is only a river between Canada and Sault Ste Marie Michigan and Sault Ste Marie Ontario Canada. They were one city until the war of 1812. Those naughty Americans tried to make Canada another State. A treaty after the war divided the city in half. Was this girl a Canadian going to school in the States? Was she on holiday? Was she an American cousin? I can find no information on the photographer and I can only guess at the date of the photograph as well. 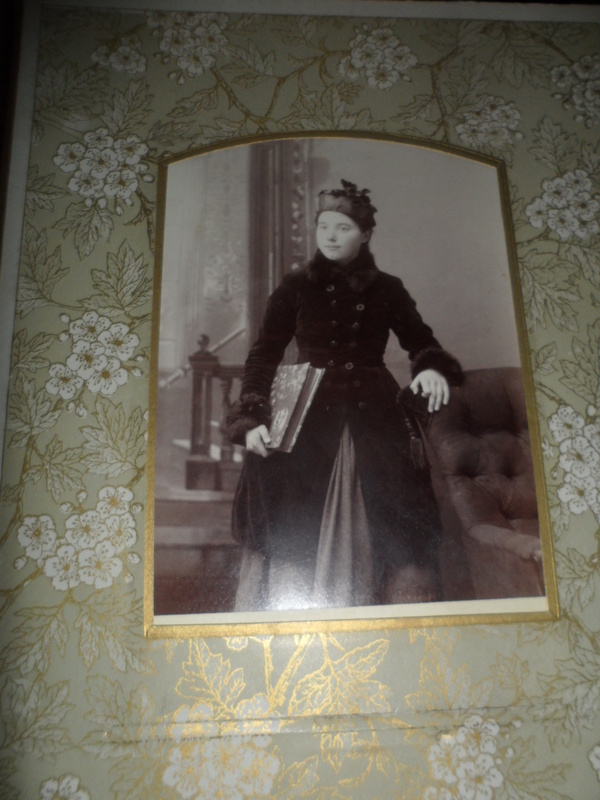 But based on the stamp in the front I’d estimate the photograph at 1882-1900. One of my costume mates (Lottie Lovett) has a blog/journal and she posted an ABC post and I’m going to steal the idea. G- Ghosts, are they real: They are something. One theory is they are souls who have not left this Earthly plain and another is demons. I find both ideas scary. J- Jealous of: people who don’t need to work (retired, independently wealthy) and can spend their days doing as they please. L- Last time you cried? : There was a death in the family this past week (due to ALS). I’ve had a few good cries daily. M- Middle Name: Marie…same one as my mother. I heard somewhere that many French folks give girls Marie after the Virgin Mary and Joseph after her husband. O- One Wish: World Peace? No really, all I really want is my wandering son to come home from Europe and stay. He has been wandering the world for the last 2.5 years and I’m tired of it. P- Person who you last called: I don’t remember! I text more than I call! R- Reason to smile: God has it all in hand. S- Song last sang: God be with you till we meet again. W- Worst Habit: eating when I am stressed out. X- X-Rays you’ve had: I’ve had tons. Head to toe. I made up the same pattern in a silk thread in a previous challenge. The bag was lovely but it doesn’t hold very much of my modern parafanalia. 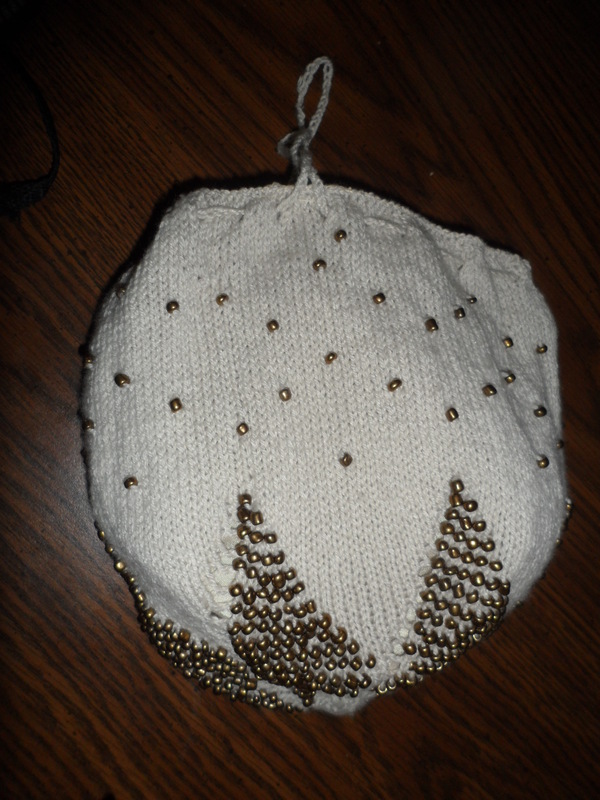 I thought the larger wool, beads and needles would make a slightly larger bag. It does. The pattern was also fun to make up inspite of the woes I had with dropped stitches so I enjoyed doing it again. Notions: fine wool, larger seed beads, set of double point needles appropriate for wool. How historically accurate is it? 70%? I think they would have lined it in silk not cotton but I had the cotton in my stash. The beads are glass and I’m not sure they would have had glass BRONZE beads. I think their metallic beads would have been metal. I am unsure that wool would have been used. The pattern called for silk but I’m not sure a thrifty woman wouldn’t have stash busted and used available wool. Hours to complete: about 30 which is much less than the silk bag. With everything being bigger I found it easier to see and handle with my middle aged eyes and hands. Total cost: $4 for the beads and $8 for the wool. We started with the babies. Front page is of two young children. 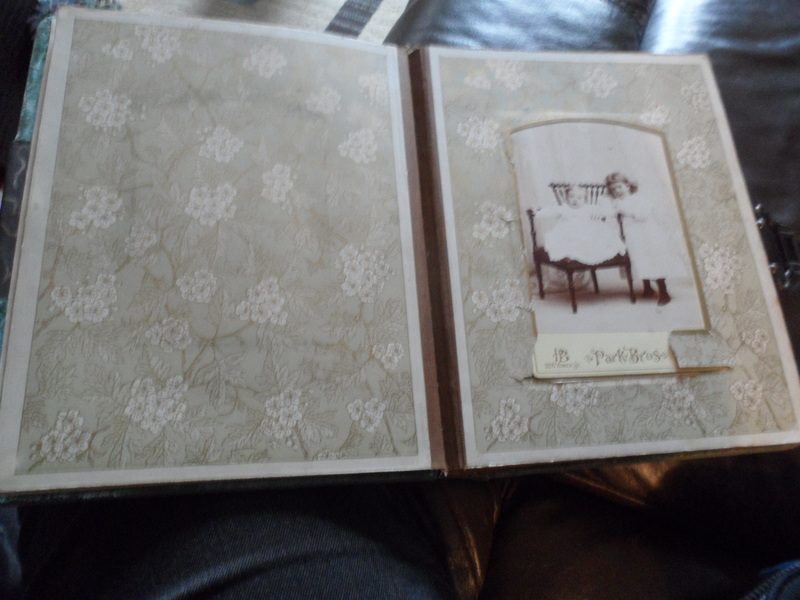 Then we turn the page in the album and we have…. My initial hope is these are the parents of the two babies. It is still possible. If it is, the photos were likely taken prior to the wedding. You will see why I say this in just a moment. Let us start with the gentleman. 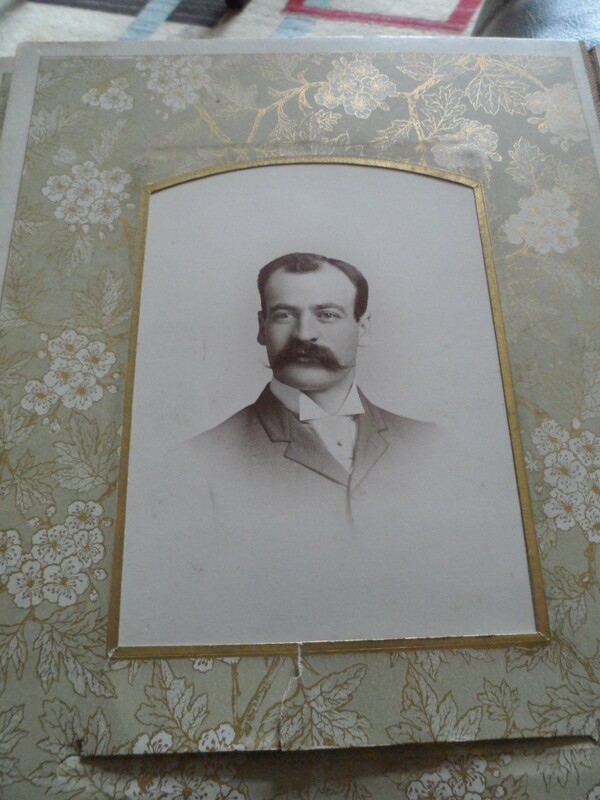 A sharply dressed fellow who looks to be in his 30’s. What a mustache! Once slid out of his sleeve we find his photograph was done in Toronto like the children were. 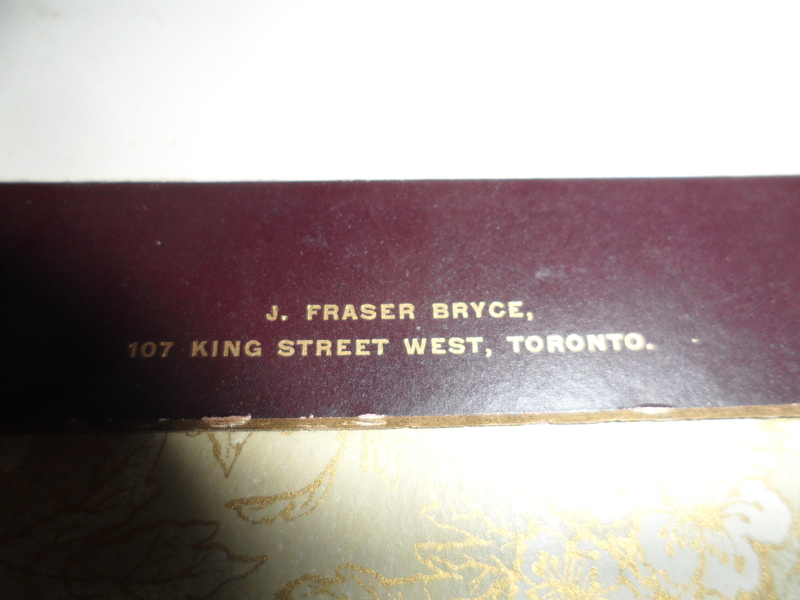 J Fraser Bryce was at this location 1885-1903. The card could be dated to the earlier end of this time span because of the color of the card. 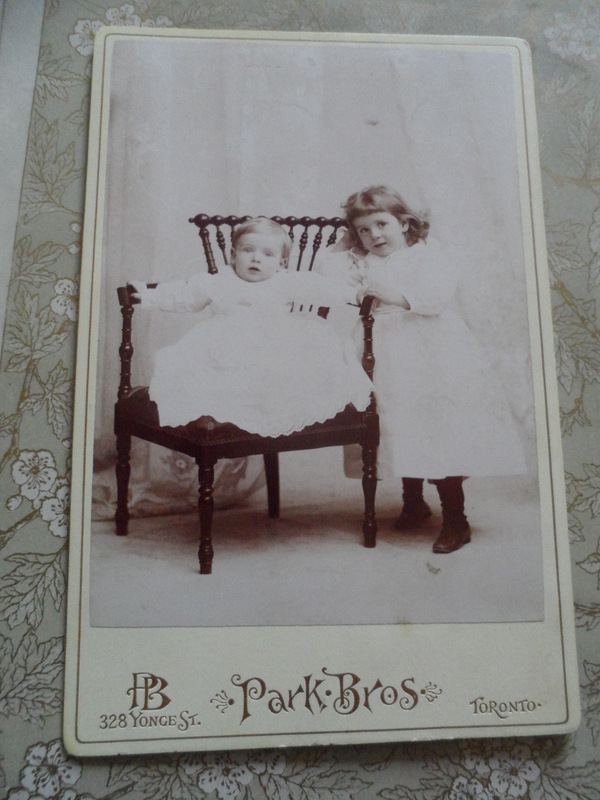 The small plain print was more common in the early 80’s (but not unheard of later) so I’d estimate the card to be from 1885-1890. This would be prior to the date I estimated for the children (1891-1900). If this is the dad, the photo would have been taken prior to their birth. The next page is the female. If this is the mom, I would guess this would be prior to the wedding on several counts. The first being, couple or wedding photographs typically have the couple in the same photograph or separately but in the same style to be a complimentary pair. Being two separate cities made the complimentary pair a bit tricky! 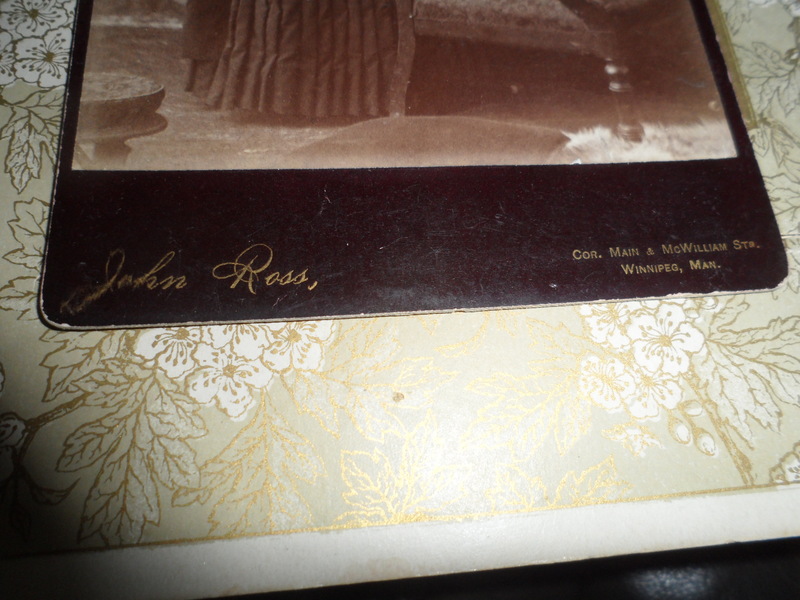 John Ross seems to have worked in Winnipeg from 1882-88. 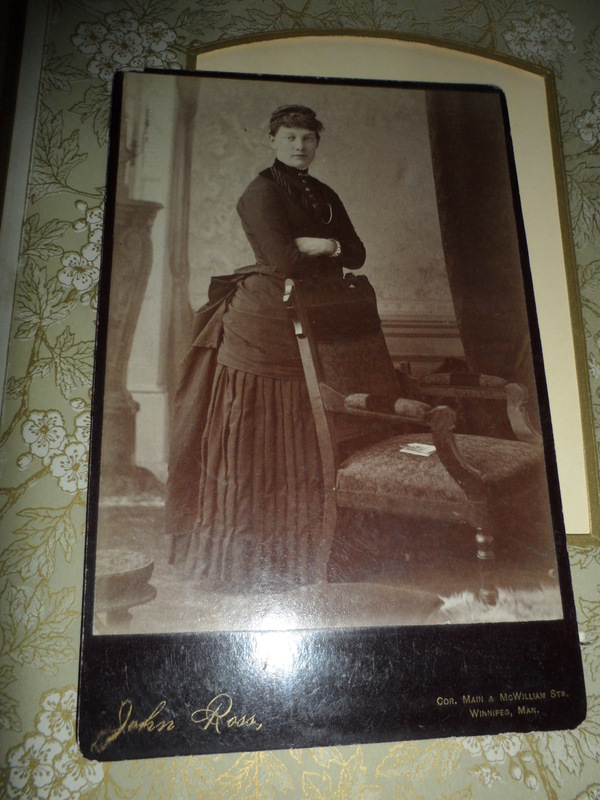 The lady’s card is dark with the photographer’s stamp in the front. 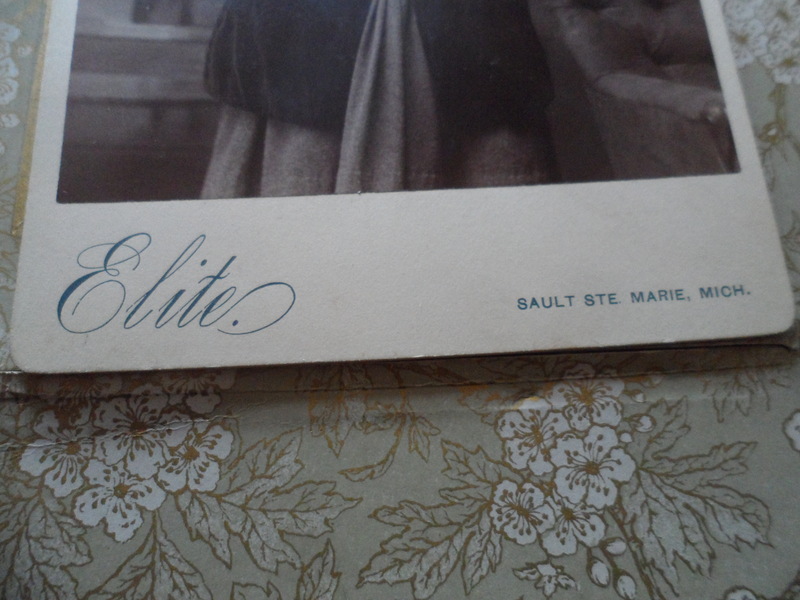 The main difference is the font is fancier which came into vogue in the 1882-1900. 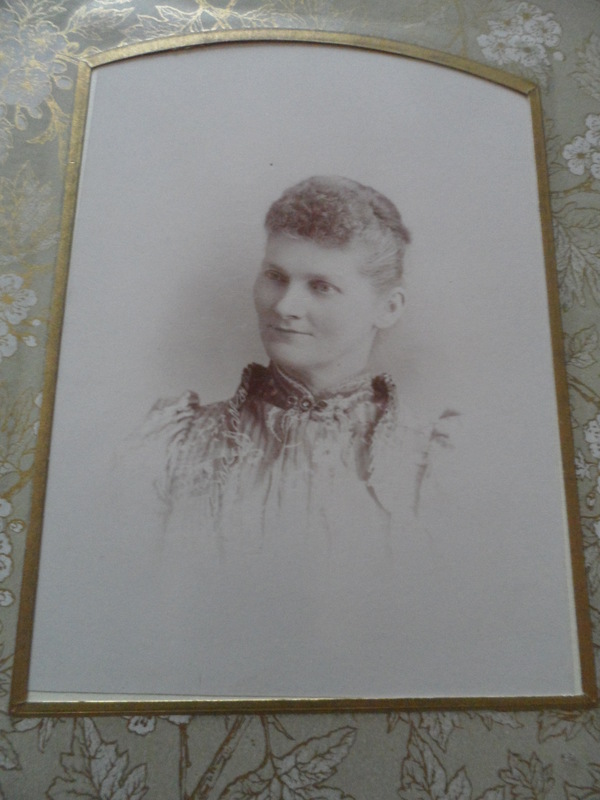 So again, based on the color of the card and the location of the print, as well as the time the photographer was working, I estimate this card to be from 1885-88. This date suits her fabulous bustle fashions to a tee. And this is a very similar time to the man and early enough to be the mother of the children. Are these the parents of the children? How did they meet? What are their names? Did they live in Toronto, where the man’s and the children’s photograph was taken? Did they live in Winnipeg where “mom” is from and where I found the album?